Meet the innovative and dynamic teachers who are a part of our One-to-One Smart Start program. My name is Sheri Burke and I am the Department Head of Canadian and World Studies. My motto is “Never settle for being adapted, always strive to be adaptive”. I believe that as an educator, it is my responsibility to not only teach students content, but to also teach them how to be good Christians and to provide them with skills to navigate their lives through an ever-changing world. Through the subjects of Geography, History, Civics, Politics and Law, I have the opportunity to teach students about their roles as both local and global citizens. My training in TRIBES, Adaptive Schools Foundations, International Baccalaureate, and Advanced Placement, has helped to shape my views on education. I believe that it is important to teach students the six 21st Century Competencies (critical thinking, effective communication, collaboration, creativity and innovation, character education and citizenship) in order for them to be successful in the future. Within the various Canadian and World Studies courses, students are exposed to a number of 21st Century technologies. In Grade 9 Geography students will begin the process of developing their Individual Pathways Plan (IPP), which is in essence a digital portfolio for students to archive their best work in preparation for their career and life planning. As students are exposed to the content found within Canadian and World Studies courses, collaborative learning, various forms of technology, career and life planning, and various literacy skills, they will have the necessary skillsets to be informed, purposeful and active citizens. I am very fortunate to play a role in their journey. I am passionate about innovative teaching and learning. I love teaching English, because it provides students with the opportunity to explore different voices and perspectives. I strive to use technology to help students develop their own voices and share it in authentic ways. I believe technology-enabled learning helps students to become truly “connected” to themselves, to their peers, to the school, to mentors, to experts and to the local/global community. I’m excited about the Smart Start program, because I believe it will help create connected learners who know that technology is just a tool to help make learning happen everywhere and anywhere–beyond the classroom walls. As a kid, I always felt out of place. Fortunately as an adult, not much has changed. I’ve always been interested in science, but my curiosity peaked whenever I looked at art. For as long as I can remember, my passion and energy have been devoted to making art, designing anything I can think of, and teaching young people how to embrace being different. 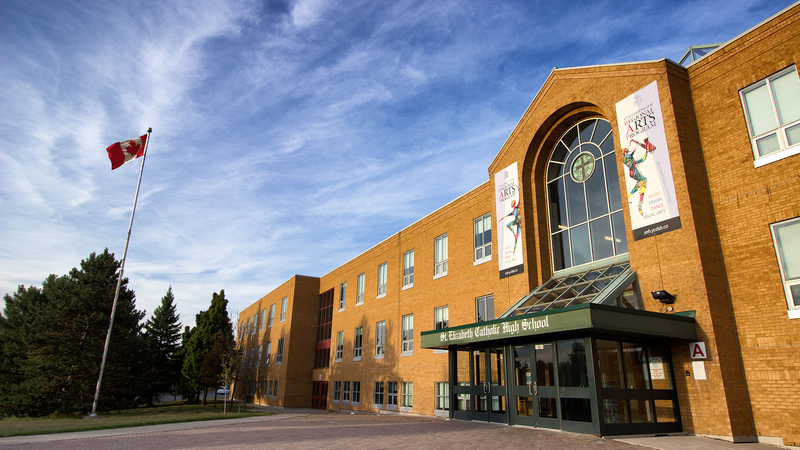 As a high school teacher (for both TCDSB & currently YCDSB) I’ve taught Science, Visual Arts, Communications Technology, Video Production, Photography, Graphic Design, Media Arts and most recently, Digital Media Arts for the Regional Arts Program. Outside of teaching, I’m also a practising artist and a freelance designer. I’m really looking forward to teaching in the next phase of the St. Elizabeth vision that is the Smart Start Program. I am very excited to be a part of the Smart Start Program at St. Elizabeth CHS. I have always loved learning other languages and thoroughly enjoy teaching them to our students. I am happy to be able to incorporate more inquiry-based learning opportunities into my French language instruction. It is very important to me that my students develop a love of the French language and have the opportunity to explore topics that are meaningful to them. Technology has made our lives better and I am excited to teach students how they can use computer software and online applications to enhance their learning. Our Business Department at St. Elizabeth offers you an opportunity to build a strong fundamental foundation in areas such as accounting, economics, leadership and management, marketing, international business, information technology, or entrepreneurship. The Grade 9 BTT 1O1 course is the first business course to take as the course introduces students to information technology in a virtual business classroom environment. Students have the opportunity to share ideas and collaborate in the ‘cloud’ and demonstrate their skills and achievements through the use of various forms of technology. I am very “techy” and my goal is to teach students how to use the computer effectively and efficiently in school, at home, and in the workplace. I look forward to working with all of you. The way we communicate has evolved greatly in the past decade, and while it is important to examine where we came from, it is equally important to adapt to the times. I look forward to exploring new forms of writing and media with my students as we work together to critically examine our world through a literary lens. One of the greatest aspects of teaching literature to students is when they see how classic works, such Hamlet or Death of a Salesman, have connections to our current society. The essence of literature is human nature, and that never changes. I am excited to be a part of Smart Start, as it provides the tools and environment for students to make these real-world connections independently. I have been part of the St. Elizabeth CHS Math Department since 2002. Since then, I have thoroughly enjoyed being part of this department, as well as being part of the school community. St. Elizabeth is a very warm and welcoming environment, even for teachers!. As a math teacher, I strive to engage students by making use of technology, and challenging them to problem solve and make connections to real-world concepts whenever possible. In the math department, we teach on SmartBoards, which enables us to make use of a variety of technological tools, as well as save our materials to be posted on each of our websites, which we maintain for each and every class. I am Alicia Murgaski, one of the many talented science teachers here at St. Elizabeth. I am a passionate explorer of all the sciences, and deeply invested in inspiring our learners to seek out careers in science and engineering. I believe whole-heartedly in using technology to enhance student learning and helping students to develop skills that are applicable in the 21st century. I will take every opportunity to make science fun by creating authentic challenges for our students. I have always loved learning! I am so excited to be a part of this innovative new program that will give students the opportunity to pursue things they are passionate about and gain important skills that will prepare them for their futures no matter what pathway they choose. I have been a teacher for over seventeen years and in that time, have seen many changes in the educational landscape and in the expectations that are held for our students once they graduate. I believe wholeheartedly in the power of Inquiry-Based learning and in the acquisition of technological skills to help students develop and foster a life-long love of learning, and give them the confidence in themselves they need to be successful in high school and beyond. My years of experience in various subject areas and in the cross-curricular discipline of Information Studies has helped me to develop a holistic view of education and I am eager to share this with our students. My name is Mina Sangermano, and as an educator for the past 20 years I have always lived by the motto: Carpe Diem: Seize the day! I view each day as an opportunity for continuous learning, unlearning and relearning. It is by adopting this positive growth mindset that I hope to heighten the love of learning. By linking the study of Religion to situations that students care about via digital platforms learning becomes meaningful, authentic and deep. Teaching and learning with technology has helped my students gain the confidence to demonstrate and share their learning in creative and different ways. Students are finding their voice to be critical thinkers capable of achieving and feeling academic, social and personal success. Teaching with technology has provided opportunities for my students to learn beyond the classroom walls. With virtual connections to experts, and other students learning has become a global perspective. Students know that they can responsibly use technology to support, collaborate, and contribute to the betterment of each other’s academic potential. Students are making the choice to use technology for doing the good. I have been a science teacher at St. Elizabeth for ten years and have the most fun when I am with my students in the classroom! Having completed my Masters of Education in Curriculum, Teaching and Learning, I have a keen interest and focus on making curriculum relevant and meaningful to my students in the 21st century. With the rapid development of new technologies in our society, I feel that we too in education must evolve our methods and topics of teaching to best suit the needs of our students so that they may become discerning and active citizens. The Smart Start program offers our grade nine students an opportunity to better recognize the connection between science and their worlds through technology and investigation in a meaningful manner. I am very excited to be part of the Smart Start program at St. Elizabeth and look forward to learning with my students in the near future! I enjoy teaching in the Canadian and World Studies Department. I teach Grade 9 Canadian Geography, Politics and Travel and Tourism. I believe that Inquiry-Based Learning is beneficial to students and helps them to explore important questions in Geography and solve real-world problems by considering a variety of different points of view. I enjoy teaching with technology and see the benefits of this for my students everyday. I am excited to be part of the Smart Start Team and look forward to working with our grade 9 cohorts.